Ever since I started poking around on Wikipedia looking at different pages for the Disney parks when I was 11 (I know, I was a SUPER cool kid), one place within Walt Disney World’s property has always had a certain allure to me: River Country. The idea that Disney built an entire water park only to close it with no real explanation after years of success always stood out to me as fascinating, especially since to this day the joint still stands abandoned. Lucky for those of us who never had the chance to experience it for ourselves, River Country’s past is very well documented online with lots of pictures and video if you know where to look. Situated on the shore of Bay Lake near Fort Wilderness Resort and Campground, Disney’s River Country was Disney’s first water park, adding a whole new experience to the still young Walt Disney World Resort located around 23 miles southwest of Orlando, Florida. In the mid-1970s, the size of Walt Disney World was considerably smaller than the one we know and love today; Magic Kingdom was the only theme park, Contemporary, Polynesian Village, Fort Wilderness Campground and the Golf Resort were the only resort hotels on property, and the Magnolia and Palm Golf Courses served as a getaway for the golfers in the family. Walt Disney World as a whole was performing rather well, but execs struggled with figuring out how to get guests to stay for longer periods – that is, until River Country was born. Disney Imagineering knew they had revolutionized the game in theme parks and that if they were going to build a water park, it would be held to the same standard as Disneyland and the Magic Kingdom. To try to go along with the theme of Fort Wilderness next-door, they settled on a rustic theme originally named “Pop Willow’s Grove” modeled after an “old-fashioned swimming hole.” To keep this theme as prominent as possible, Imagineers wanted to make guests feel as if they were actually swimming in Bay Lake. To make this possible, a unique filtering system was developed which used actual lake water and they built a dam between the land and Bay Lake, creating a type of man-made lagoon which would eventually become River Country’s main pool. (Side note: Disney sure does like to put the words “man-made” and “lagoon” together, huh? I’m looking at you Seven Seas Lagoon.) The main focal point of the park would be a man-made mountain which would have slides winding around it. To immerse guests further, Disney brought in pebbles from Georgia and the Carolinas and made the bottom of River Country’s main pool sand. On June 19, 1976, Disney’s River Country opened its doors for the first time, commemorated by Susan Ford (President Gerald R. Ford’s daughter) sliding down Whoop ‘n Holler Hollow, the park’s main slide duo. Admission was $4 for adults and $3 for children (that’s around $13 and $18 in today’s money), and even though it frequently closed due to reaching capacity, River Country was a hit! River Country had a small but mighty repertoire of attractions and fun things to do, so let’s go through them! It boasted two different pools: Bay Cove and Upspring Plunge. Bay Cove was the one with the sand bottom and lake water, was half an acre in size, and had a tire swing, boom swing, rope climb, and T-bar drop, while Upspring Plunge was smaller, used normal water, and was a more relaxing and recreational swimming pool. As far as slides went, Whoop ‘n Holler Hollow was a duo of waterslides which acted as the main attraction of the park and emptied into the Bay Cove pool. Slippery Slide Falls was another pair of slides with a 7-foot drop down into the Upspring Plunge pool. The White Water Rapids was a sort of inner tube slide that started out as a lazy river, then picked up speed going downhill ending with a splash down into Bay Cove. Indian Springs and Kiddie Cove were little areas with slides and spraying fountains for little kids and preteens respectively, and Cypress Point Nature Trail took walkers through trees along the coast of Bay Lake. A popular means of transportation at River Country was a Barrel Bridge á la Tom Sawyer’s Island in Magic Kingdom. 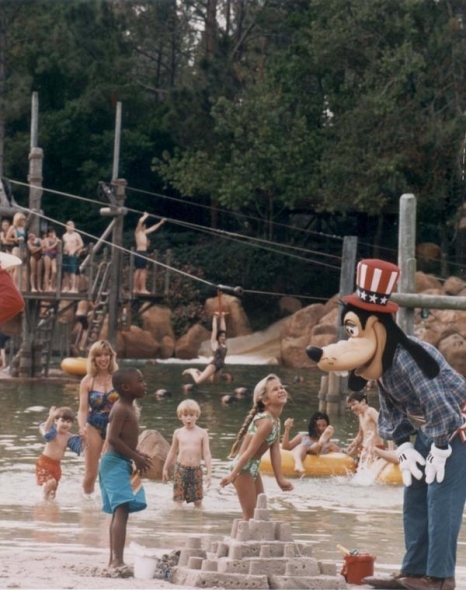 Goofy, believe it or not, was River Country’s mascot and could be seen occasionally sliding down Whoop ‘n Holler Hollow! You could also find him on a variety of park merch and on the logo. All seemed to be going pretty well in River Country, and on November 2, 2001, the park closed for its annual refurbishment at the end of the warm season with plans to open up the following year as normal. However, when springtime rolled around, River Country remained closed for that season…and the next one…and the next one…and the next one, until Disney announced in 2005 that the “OG” Disney water park would remain closed. But why? There were lots of whispers on the reasons why River Country just never reopened, some reasonable and some far out. On the far-out side, rumors circulated that River Country had closed because a patron died after being exposed to a brain-eating amoeba in the Bay Cove pool (the one that used water from Bay Lake). And while this did unfortunately happen, that was in the ‘80s and couldn’t possibly be the reason for the park’s closing over a decade later. More likely was the drop in park attendance, new laws, and drop in WDW attendance across the board. Following their openings, Typhoon Lagoon and Blizzard Beach were very popular, and while this was good for Disney as a corporation, River Country suffered as it was considerably smaller than the other two competitors on property (Typhoon Lagoon was 9-10x bigger). New Florida laws concerning water parks needing to use municipal water also likely played a key role, seeing that one of the most iconic aspects of the park relied on lake water. Finally, following the September 11th attacks Walt Disney World saw an overall decline in attendance, so it was likely more feasible for Disney to close up River Country with its two previously mentioned issues than to cut corners elsewhere. So just like that, River Country closed. Disney must have been at least considering reopening the park eventually though, because it has stood abandoned since its 2001 season-end closing (as of December 2018). If you do a simple Google search you can find all sorts of photo and video of the abandoned park. I’ll leave that exploring to you since this post is gettin’ pretty long, but I encourage you to do so! This neat article by All That's Interesting and this YouTube video by Dark Exploration Films are good places to start! For 25 years, River Country entertained guests of all ages and gave Walt Disney World that extra experience outside of the theme parks that executives felt was missing. During those 25 years, Walt Disney World Resort grew to a size very similar to how we see it today: Magic Kingdom, Epcot, Disney’s Hollywood Studios (then known as Disney-MGM Studios), and Disney’s Animal Kingdom were all opened by April 1998. Disney’s Typhoon Lagoon and Disney’s Blizzard Beach Water Parks opened in in 1989 and 1995 respectively. Nineteen of today’s twenty-eight resort hotels were in operation. Speaking of resorts, Disney recently announced that Reflections—A Disney Lakeside Lodge will be constructed on River Country’s land set to open in 2022. The resort will be a Disney Vacation Club property with 900 rooms and a nature lakeside lodge theme. It will be interesting to watch this project come to fruition and see if and how Disney will make references back to old River Country in the new resort. Maybe the main pool will be called Bay Cove or Upspring Plunge or have a mini version of the park re-created for guests to enjoy? That would be pretty cool, but we’ll just have to wait to find out! 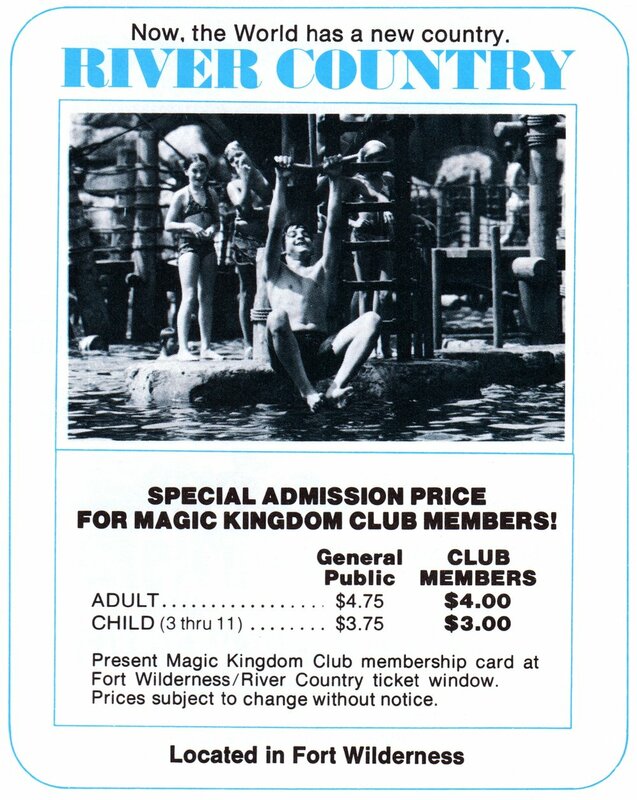 Do you have any memories of River Country? I’d love to hear them, so sound off in the comments! I hope you all have enjoyed my first blog post, and if you have any questions or topic ideas, drop them down below too! Until next time, see ya real soon! Welcome, foolish mortals, to The Ghosts of Disney Past! My name is Mason Lawrence, and even though I’m just an average almost-20-year-old from Iowa, I’ve been going to the Disney parks pretty much my entire life. By day I study history and social studies education at Iowa State University (go Cyclones! ), but in my spare time I love learning about Disney history and trivia. My goal here is to give you the background and teach you something you might not have known about some of your favorite Disney parks, resorts, and attractions both past and present! Now, as they say, “look alive,” and we’ll continue our little tour. And let’s all stay together, please. All images and video included are copyright to their respective holders.